She acts as if she knew exactly that eggs laid on top of the leaf would wash off in the next rain shower, be desiccated by the hot rays of the sun or, perhaps even before this, be discovered by the keen eyes of hungry birds. It seems fairly safe to assume that no butterfly ‘knows’ what it is doing. 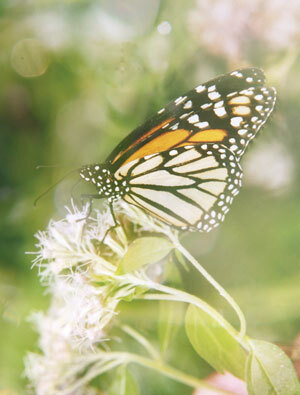 It seems unlikely that a butterfly thinks through the possible consequences of its action. When carrying out this act of egg-laying, so vital for the survival of their kind, all the females of each species behave in the same way, without first having to learn this proper egg-laying procedure, with its seeming wisdom. Butterflies brought up totally alone and isolated from all of their fellows, with no opportunity to copy this behaviour from others, do not differ in the slightest in the way they carry out this task. This means, of course, that the behavioural instinct must be present from birth. The information necessary for such behaviour must already be there in the egg, stored in coded form ready for future decoding and use. 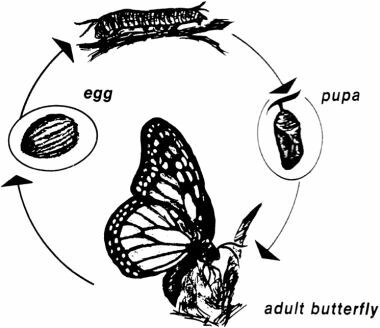 After all, the information-bearing substance of heredity, the species-specific DNA, does not change in the slightest during the transformation (meta-morphosis) of this egg to the caterpillar stage, then through the pupa right up to the imago, the finished butterfly. Not one scrap of new information (through learning, for example) is added to the DNA during this entire life-cycle. The remarkable thing about this tiny butterfly egg is that it contains the information for all three stages stored in its microscopically small nucleus. It must contain the instructions for building and operating a caterpillar; for the pupa which develops from this and for the development and operation of the butterfly. All three of these stages arc remarkably different in form, function and behaviour. Every one of these radically different programs must be called into play and executed at exactly the right time, cleanly separated from the others. The caterpillar develops cutting jaws, well-suited to chewing on leaves. This is the same diet for which its intestine, with its specific digestive glands, is so well suited that it often eats exclusively the leaves of a single plant species. The butterfly, on the other hand, has jaws no longer suited for chewing. Instead, it has a long sucker (proboscis) which enables it to drink flower nectar for nourishment. This butterfly lays its eggs exclusively on the leaves of the same type of plant on which it was nourished as a caterpillar, following its inherited, instinctive program. Underneath their innocuous exterior, these eggs contain just the right amount of protein-building substances. Not even the tiniest micro-drop too little or too much to manufacture a complete, albeit still very tiny, caterpillar body; the jaws, eyes like scarcely visible points, smell and taste organs tuned in to a particular plant species, an intestine with all necessary digestive glands, three pairs of segmented breast-plates and those eightunique stumpy feet. The soft soles of these feet are able to adhere as firmly to the most mirror-smooth surfaces as their circular bristles cling to rough surfaces. This caterpillar gets its oxygen from delicately stiffened breathing tubes (tracheas) which open on to its flanks, protected from the finest of dust particles by miniature sieves. Also larger caterpillars often show quite a complicated pat-tern of coloration. Specific pigments of varying amounts and densities deposited in the right places according to a strictly species-specific plan can give multi-coloured surfaces, stripes and spots. This results in extremely effective camouflaging to protect the caterpillar from predators such as birds. The growth of this butterfly’s larva requires a further program that also has to be carried out precisely. Because the leathery skin of a caterpillar does not grow along with it, it must shed the skin from time to time. However, this will only work if, at just the right time (according to a plan of course), a new skin has developed under the old one. This new skin still has to be somewhat folded up and thus more flexible before it replaces the old. When the caterpillar is fully grown, it sheds its skin for the last time. But what now appears—the pupa—has almost no resemblance to a caterpillar. This motionless pupa has neither head nor legs. Before its transformation, the caterpillar (directed again by programmed information) spins a silken ‘safety-belt’ with which it anchors itself against a twig. Its apparent motionlessness is purely an external feature. Under this seemingly lifeless shell, something quite unbelievable is happening. The old caterpillar organs, with the exception of the nervous system, begin to totally dissolve into smaller groups of cells, even to disintegrate into single cells. From this ‘cellular soup’, new and (in part) quite different organs begin to develop. It is precisely when you consider this puzzling rebuilding process—metamorphosis as it is called—that you are struck with the certainty that everything is happening here with the utmost precision according to an extremely cleverly programmed plan. Without central direction towards a pre-programmed goal, a random agitation of these countless millions of cells could never give rise to anything other than a disordered, chaotic, tumour-like heap of cells, which would not be capable of survival. What happens instead is that new functional organs are constructed, which then collaborate and complement each other in a purposive and error-free way to form a new and radically different organism—the butterfly. 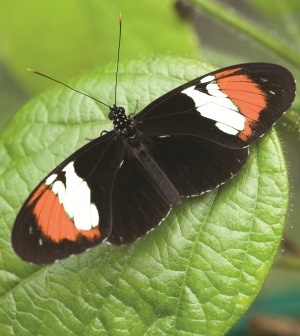 Consider this glorious butterfly, with perhaps spectacularly colourful wings, which it immediately knows how to use in the right way without time-consuming trial and error, this butterfly which now has large, faceted compound eyes and a sucker rolled up ready to be extended and retracted as needed. Now compare it to its beginnings as a caterpillar. Ponder, for example, the butterfly’s finely jointed long legs capable of landing safely and clinging to blossoms which blow back and forth in the breeze. Blossoms which it is able to locate from remarkable distances with the help of its long feelers acting as highly sensitive organs of smell. The young butterfly is instantly able to properly utilize all these various organs, because of its inherited programs for instinctive behaviour. To get some further idea of the degree of organization involved in this transformation of a creeping, worm-like caterpillar into the flying butterfly, let us simply look at just one small part of the butterfly, the patterns of colour in its wings. We are dealing here with mosaic pictures, made up of countless thousands of individual, vividly coloured dermal scales. On a single square millimetre of wing surface, there can be as many as 600 of these, arranged in straight lines as if drawn with a ruler and systematically overlapping each other like roofing tiles. These mosaical patterns on butterfly wings are for all practical purposes transmitted unchanged from generation to generation as part of this remarkable program. This means that the position and the final colour (whether through pigment or structure) of each of these countless individual wing scales must already be encoded as exact information in this very same egg cell nucleus—alongside all of the other incredibly complex and intricate information for the construction and the functioning of all the other organs of this creature. This degree of miniaturization of information storage can hardly be imagined. To appreciate the technical difficulties that have been mastered here, consider the fact that the exactly symmetrical patterns on a butterfly’s wings developed while the wings were totally crumpled up in the cramped conditions of the pupal case. Nevertheless, when the wings unfold for the first time, one will always see the distinctive pattern unique to that species. The butterfly Araschnia levana has an even more incredibly complicated feature. If you compare the butterfly which slips out of the pupa in spring with one of the same species which lived out its pupal stage during summer, you would think that you were faced with two completely different, not even closely related, types of butterflies. They are conspicuously different in their basic colouration and their wing mosaic. In this case an environmental factor, namely the daily light duration, triggers off the development of one or the other of the two patterns which already exist as coded information in the DNA of the nucleus of the egg. It is already astonishing to have two such programs stored in this tiny living microchip. But in addition to this, there must be a further program, a super-program as it were, which is sovereign over the various developmental pathways of this cellular tissue and gives it instructions, to bring one or the other of these pre-existing programs to realization. This super-program therefore recognizes signals from outside, in this case the length of the day, and gives instructions to ‘switch on’ the appropriate seasonal form. The ability to recognize these secondary environmental factors is also, therefore, firmly implanted in this egg cell nucleus. 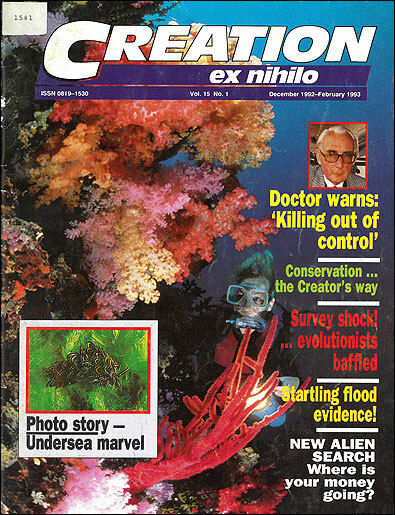 Granted, at the time Darwin’s Origin of Species impacted on the world, nobody knew anything about computers, their construction, or their programming. Nor about the sorts of insights this would provide into the long neglected achievements of ‘living computers’. In today’s computer age, however, we know that information of this order never arises from unprogrammed matter by itself. While it may be transmitted from one ‘machine’ (having equal or greater information) to another, the ultimate origin of all such information is only to be found in mind, in an intelligence outside of the system itself. According to verbal communication from the Australian Butterfly Sanctuary (Kuranda, Far North Queensland) one does see occasional exceptions to this general rule. The tropical Australian Ulysses butterfly, for instance, is such a ‘tense, jittery’ creature that it sometimes lays its eggs in what appears to be an unseemly hurry. In such instances the eggs may end up on the ‘wrong’ side of the leaf. However, more often than not it will properly fulfil its instinctually programmed preference for the underside. Scales in white regions usually have no pigment. They obtain their whiteness because of their particular structure, through the total reflection of sunlight, the same reason why snow looks white. Even blue is not a colour as such in the butterfly wing (just as the sky has no blue pigment), but comes about due to the very complicated fine structure of special scales causing scattering and interference of light. Nietzsche, Friedrich, Die Fröhliche Wissenschaft, 1882.